I bought the extensions back in January for my Ford Ranger. I have 7-1/2ft curved ramps and am loading a '14 H-D Heritage Softail. I tried without the extensions but bottomed out - the ramp flexes a bit from the 750lb bike. Installing the extensions allowed me to load-up my bike successfully! Thanks for the quality product! On my way from Toronto to NC tomorrow, then riding the rest of the way to Florida. Lucky I found your product when I was researching and preparing for my trip! Kudos for an excellent product! My 2014 F350 Super Duty tailgate is not level when open. For whatever reason Ford opped to make the cables about 1 inch too short. My Weston tailgate ladder was almost useless until I added the cable extentions. Thank you for making an excellent product! And made in the USA is another plus. My truck is the stock height, but since it is a ¾ ton it is a little tough to load bikes. I used them this week to load a super heavy, pig of a motorcycle and that little difference in the angle of the tailgate made a huge difference in the angle of my ramp. This cool little invention also reduces the “break over” at the top of the ramp….should make things much better for the guys with low bikes. Already showed them to a few friends that think they are terrific. Exactly as described, a 30-second installation, why didn't I think of that? (Actually I did, but my solution would have been more complicated--I intended to have longer cables onto which I would have swaged new fittings.) I like the simplicity of your idea. I look forward to the adjustable cables which your site says are in the future. While I have quads and dirt bikes, my principal reason for buying your links is for slower, more controlled loading of my long-track mountain snowmobile. The break-over from ramps to tailgate is a problem since so little of the sled track is in contact with the ramps/ tailgate/ truck bed at the point when the sled teeters over from ramp to truck. But of course, you already know that, I guess. 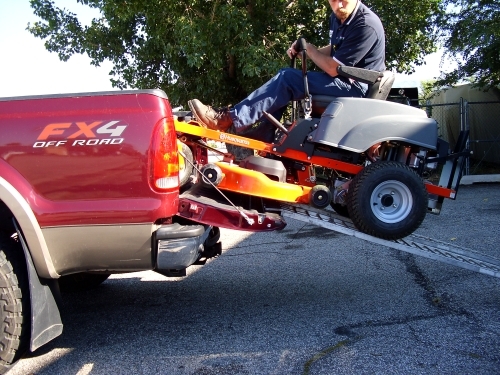 Mackie Enterprises, an Aluminum Ramp Specialist, using Rider Tailgate Lowering Links (FD3) to load a Husqvarna Mower. 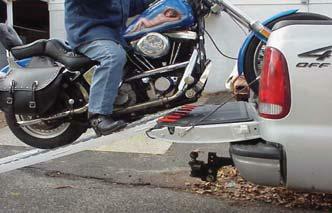 Mackie Enterprises using Rider Tailgate Lowering Links to load a Harley. We love to hear from our customers. Click here to send us your experience with our products.